Thank you for joining me to share in my passion for shiny things and the simple joys of creating. 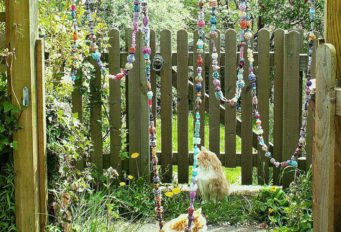 I’m most contented when there is nothing to do but spend time with the beads, and even happier if the sun is shining and I can sit in the garden beading. Each design is made for me first because I love to wear beadwork. Next it is taught in classes and workshops because much of my year is taken up visiting to teach groups and travelling to shows and events. I love it because every class is different, but they each have at their heart the pure pleasure of beading together. The moment when an idea clicks for a beginner is magical, equally so, when an experienced beader turns at the end of the day to say they have had a great day and discovered something new. Other designs are created exclusively as kits, often using components I’ve collected on my travels and for which there may only be a limited supply. Sometimes the story of an idea is too big for just one design, so I write books too. My books are a way of sitting down and having a conversation with you, each chapter revealing a new design, or a fresh way to use a technique. Beaded beads decorating my garden.